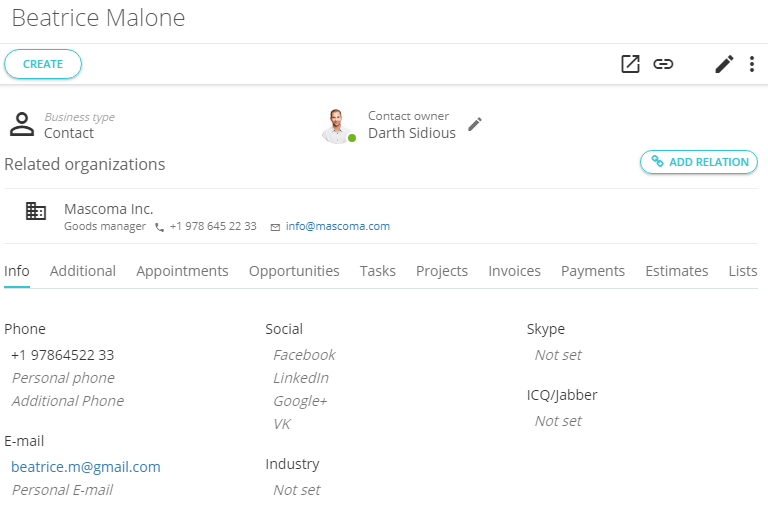 A list of all contacts and companies that your company interacts with is displayed in the CRM application, on the Accounts tab. In their cards, the entire history of work with them is displayed: the events carried out, the projects implemented, the invoices issued, the payments received, and so on. To one organization any number of organizations can be linked. This is convenient if at your work you communicate with different people on different issues within the same organization. When you click on the organization name, the sidebar opens, in which you will see the entire history of working with this organization. For example, linked contacts, planned events, current tasks and projects, opportunities, estimates, invoices, payments, etc. On the organization detailed page, you can see all the activities, including archived ones. To go to the detailed page, click on the arrow in the upper right corner. Contacts – individual people, who can be either your individual clients or contacts in any company. For contacts, as well as for companies, you can issue invoices, run projects or opportunities, assign tasks to your employees, and plan appointments. When you click on the contact name, a sidebar opens for a quick view of the current events for the contact. 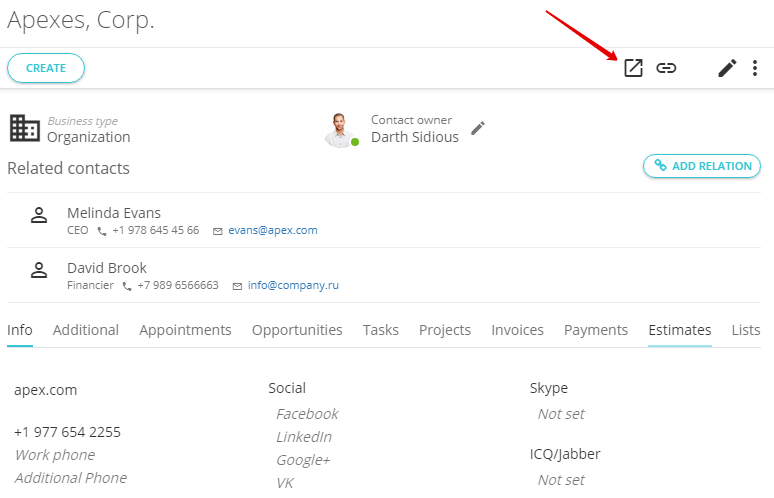 Here you can see in one click all contact details, scheduled events, current tasks, opportunities, invoices, etc. By clicking on the arrow in the upper right corner a detailed page will open. On it, you can see the entire history of works: current and arched opportunities, tasks and events (appointments, calls, e-mail), projects, etc. Between companies and contacts, you can create multiple links or relations. For example, one company may have several representatives – contacts. And vice versa, one contact can represent several companies and work in different positions at each company. Information about this will be displayed on the contact card. How to create a company and contact? How to work with an account card? keyboard_arrow_left How do I set up forwarding specific types of e-mail letters from Gmail?